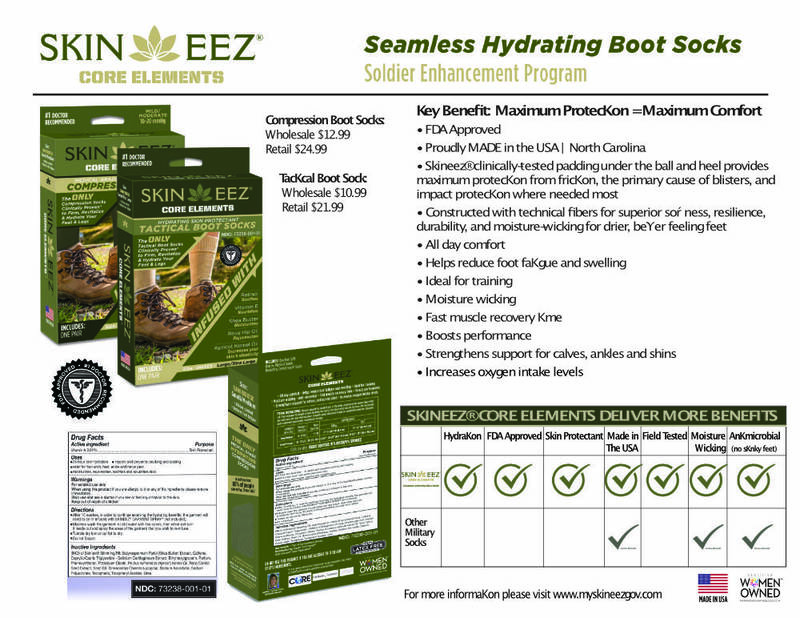 Made IN America, SKINEEZ® SKINCAREWEAR® socks are a one of a kind hydrating medical grade compression wear, patented and clinically proven to renew and repair the skin while increasing circulation. Wickable Fabrics made with a revolutionary microencapsulated technology that helps to deliver cosmetic nutrients to the skin day and night – Perfect for all climates. Our award-winning combination of smart fabrics and skincare outperform all other compression garments. All materials, infused with hydrating ingredients such as Shea Butter, Rose Hip Oil, Vitamin E, Apricot Kernol Oil, and Retinol. Clinically proven to deliver firmer, smoother and younger-looking skin. Board-certified Surgeons use this compression nationwide including Dermatologists, Orthopedic Surgeons, and Plastic Surgeons. Fabric also found on athletes on and off the field as well as Pilots and Runners. Wal-Mart Pharmacies, CVS Health Cardinal Health, as well as Hospitals and Clinics are currently carrying SKINEEZ® Nationwide. Turnkey operations are in North Carolina at an ISO certified Factory. FDA Approved – Medical Grade Hydrating Compression Socks and Therapeutic Hydrating Fingerless Gloves. 100% of people felt this fabric was softer and more comfortable than any other fabric they had worn. 89% of people considered SKINEEZ® SKINCAREWEAR® to be easier to perform than applying a cream once or twice daily. 80% of people saw softer and smoother skin in less than an hour justby wearing. Women-Owned and give back to many nonprofits charities. Made in America, SKINEEZ® SKINCAREWEAR® socks are a one-of-a-kind hydrating medical grade compression wear, patented and clinically proven to renew and repair the skin while increasing circulation. Wickable Fabrics made with a revolutionary microencapsulated technology that helps to deliver cosmetic nutrients to the skin, day and night – Perfect for all climates. After ten washes, reinfuse the fabric to renew the fibers for another ten wearings’ and so on. Instant – Look and feel slimmer, increase moisture to the skin, felt softer and smoother skin. Week 1 – Diminish skin’s imperfections. Smoother, tighter and more vibrant skin. Weeks 2 – 4 – An Average increase of skin elasticity up to 19%, firmer skin tone. Cause For Change LLC dba SKINEEZ Skincarewear is enrolled in the Simplified Acquisition Program of US Federal Contractor Registration.